On homeland soil, a terrorist group tears up suburban life as they leave thriteen dismembered girls in their wake, and the CIA employs a vicious serial killer to eliminate the cell as the number of corpses rises. Trapped in a maze of corridors and hunted like vermin, a small group of visitors desperately seek and exit from a maximum security death row facility. 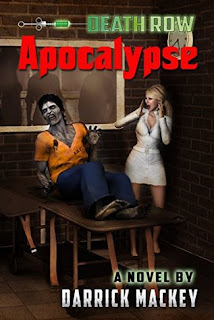 Murders, rapists, and prison guards alike turn zombie and pursue the desperate gorup as their small number dwindles. Double-crossed by the CIA and sentenced to death by lethal injection, Blaine Wilken finds himself exercising his talents as he seeks a way out of the facility. When destiny laughs in the face of horror and forces the group to place their faith and trust in the most lethal serial killer in US history, one has to wonder which predator to fear as they enter the deepest shadows of a Death Row Apocalypse. It’s funny that when I was first asked to review this book I turned it down. Zombies are just not my thing. I was curious so I read the summary. That was all it took to make me contact him and tell him to send me a copy. I will say this book is not for the faint of heart. There is plenty of blood and gore. The setting of this book is quite unique. The main character is a former CIA operative who was betrayed, tried for murder and is awaiting execution by lethal injection when he finds he and everyone else has bigger problems. Before he was betrayed by the CIA he was one of their most lethal killers for hire. That is what it seemed so appropriate that everyone in the prison who wants to survive must depend on him. How ironic. He must fight zombies if they are to survive. If you are a lover of zombie movies and books then you will love this take on the zombie genre. If you fear reading about blood and gore then stay away from this. It is fast paced. From the minute you pick it up to the minute you finish it the action keeps going. I have to say that zombies are still not my favorite, but throw in something unique like this and I’ll be more apt to read it.